At the Summary step of the wizard, review the connection details and click Finish. 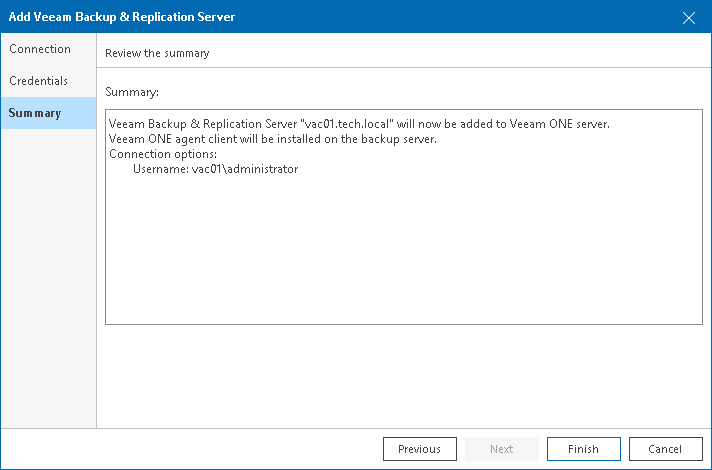 Note that it may take a while for Veeam ONE to collect and display configuration and performance data for the newly added backup server and managed backup infrastructure components. After you connect a Veeam Backup Enterprise Manager, Veeam ONE automatically builds the hierarchy of all managed backup servers. Next, it connects managed backup servers and imports from these servers data on job sessions for the previous week.